Montréal, le 20 février 2012 – La Commission des droits de la personne et des droits de la jeunesse demande au gouvernement du Québec de réviser sa législation et ses programmes en matière d’immigration pour mettre fin à la discrimination systémique dont sont victimes les travailleurs migrants. L’avis « La discrimination systémique à l’égard des travailleuses et de travailleurs migrants » est disponible à l’adresse www.cdpdj.qc.ca. QUEBEC – Migrant workers in Quebec are victims of systemic discrimination, says the Quebec Human Rights Commission in a report calling on the provincial government to promptly change its immigration programs. In a study released Monday, the commission noted migrant workers are discriminated against because of their national origin, their race, their social condition, their language or – in the case of live-in caregivers – their gender. In 2010, some 7,000 low-skilled migrants from Guatemala, Mexico and the Caribbean were hired in Quebec, mostly to work temporarily in the agriculture sector. A handful of those, about 400, are live-in caregivers from the Philippines working as domestic aides, according to the report. “Our analysis shows the severe vulnerability in which migrant workers find themselves. The situation is even more difficult for women,” the commission noted. 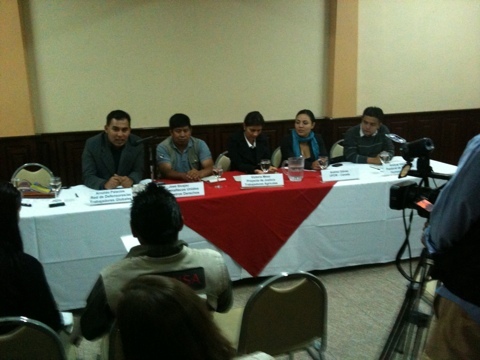 In front of a packed room and numerous local journalists, migrant worker organizations wrapped up a two day conference on temporary foreign workers, holding a press conference this morning in Guatemala City. Advocates called for more oversight and involvement on behalf of the Guatemalan government, who is presently allowing foreign recruiters to select workers without regulation. Many workers have raised the issue of paying hundreds and thousands of dollars to private agencies that claim to be able to arrange contracts in Canada or the US. “We need a public policy to regulate these programs”, said Amilcar Vasquez from the Pastoral de Movilidad Humana a church based group. Canadian advocates mainly blamed the International Organization on Migration and FERME, the Montreal based private agency that recently opened an office in Guatemala and recruits locally without oversight or regulation. “These agencies are violating our rights, and we call on the Guatemalan government to do something”, said Jose Sicajau a migrant worker who used to work in Canada and who now heads an organization named Guatemalans United for Our Rights. Representing United Food and Commercial Workers – Canada, Andrea Galvez pointed out that temporary workers have been asked to pay 500 dollars to join the program. She further added there are elements of local recruiters practices “that are completely illegal”. Last year 8000 Guatemalans went to work in Canada. The first conference to bring together Guatemalan migrant workers, supporting organizations, workers advocates and government reps started this morning in Guatemala City. “There are many violations but very few of us raise our voices to speak about them”, said Jose Sicajau who used to work in a farm near Montreal and who now leads an organization representing Guatemalan migrants. Sicajau was never allowed back into Canada after speaking out about problems with his employer. The aim of the conference is to allow workers to share experiences and organise. Guatemalan migrants traveling on official work visas have few opportunities to ever meet and talk about the challenges of working abroad. While the conference brings together workers who have traveled to the US and Mexico, the majority present have spent time in Canada. “We have to go to work there because we are so poor, because we are hungry”, said a worker who also added that the fear of being blacklisted and kicked out of the temporary workers program is so strong no one dares to speak out about unfair treatments and abuses. While the Guatemalan government, the mexican government and the US have sent representatives, the Canadian embassy has so far refused to confirm it would send anyone to speak to workers. Problems raised by the migrants included the loss of funds paid to “recruiters” who promise to place workers, some having even ended up loosing their homes, several workers spoke of being blacklisted, of abuses and of having their documents taken away from them. As the Peruvian immigrant community in Kitchener-Waterloo — and families at home in Peru — mourn the loss of 11 of their own in a deadly highway crash in rural Ontario on February 6, at least one Toronto daily newspaper two days later prioritized instead the highway death a single girl (a white, 19-year-old aspiring model), pushing the 11 Peruvian lives to page eight. This is but a symptom of a larger problem that suggests that white/Canadian lives are more valuable than their non-white/non-Canadian counterparts. Consider the circumstances: Monday’s crash, which occurred as the Peruvian workers were returning home in a 15-passenger van from work on an Ontario chicken farm, killed 11 passengers and left the remaining three in critical condition. These kinds of vans are cheap and usually carry more workers than would a more expensive truck or SUV. They have also been described as “death traps” and have been investigated and banned in several states and provinces for failing to meet safety standards. Not surprisingly, Ontario police blamed the accident on “driver error” but made no mention of the fact that the vans are designed to carry cargo, not people — a telling indication of the way migrant workers are viewed in rural Ontario. The priorities reflected in the Metro News piece are rooted in Canadian government policy that prioritizes the interests of business over the lives of people, especially people of colour in or from foreign countries. To their credit, the Canadian media has picked up on the issue of the safety of the vans. The Toronto Star ran a short op-ed on Wednesday, February 8 insisting that there be an investigation into the use of these vans on Canadian roads. While a good starting point, the piece got muddled in safety assessments and missed the larger point: that it is not Canadian workers but foreign migrants — coaxed into leaving their homes to work temporarily in Canada because they will accept low wages and use few public services — who are being placed in these vehicles whose safe usage has yet to be determined. This is no coincidence. Targeted by employers on the basis of their weak economic and social positions, migrant workers in Canada are consistently placed in unsafe conditions that lead to injury, disease, and death. South Asian workers brought to B.C. to pick berries are routinely paid less than minimum wage and are crammed into ramshackle housing without toilet and plumbing facilities, ventilation, or heating. Medical journals have repeatedly noted that the backbreaking labour, long hours, unsafe and unsanitary living conditions, and repeated exposure to pesticides and other chemical agents for workers as young as 12 means that up to 85 per cent of migrant workers in Canada suffer from serious injuries and illness, from musculoskeletal destruction to waterborne intestinal disease. In fact, Monday’s accident wasn’t the first time that migrant workers have been killed in Canada while crowded into the same cargo vans in which 11 people were killed. A similar crash in 2004 killed three and injured five people in Ontario, while another crash in B.C. in 2007 killed three workers. With many questions remaining, the head of Canada’s largest private-sector union wants a formal inquest into one of the most deadly crashes in Ontario history. Wayne Hanley of the United Food and Commercial Workers (UFCW) union sent an open letter to Ontario Chief Coroner Dr. Andrew McCallum Friday, asking him to investigate Monday’s rural road disaster in Hampstead that killed 11 people.